Software installation and deployment made simple–that's the promise of InstallAnywhere from Zero G Software. Are you harnessing the full potential of InstallAnywhere in your software installation project? InstallAnywhere Tutorial and Reference Guide is the authoritative guide for users of InstallAnywhere. It helps you maximize your investment in this powerful deployment tool by taking you step by step through easy-to-follow exercises that will unleash the power and productivity of InstallAnywhere in your organization. 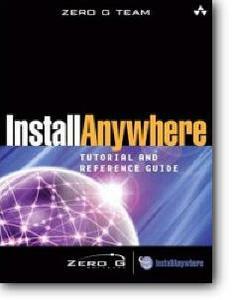 InstallAnywhere Tutorial and Reference Guide is perfect for developers of all knowledge levels. Whether you're just getting started or an experienced user of InstallAnywhere, this handy tutorial will help you build and reinforce the skills necessary to create reliable installations every time. And after you've mastered those skills, it is an ideal resource for troubleshooting the most common installation problems. Inside you'll find best practices for making even the most complex software deployments easy. You will learn essential InstallAnywhere user principles and effortlessly discover why InstallAnywhere is the only software installation and deployment solution you'll ever need. InstallAnywhere has been recognized as the preferred multiplatform software deployment and installation tool by developers worldwide. It is the recipient of prestigious industry accolades, including two consecutive Java Developer's Journal Readers' Choice Awards, the Jolt Product Excellence Award from Software Development, and JavaWorld's Editor's Choice Award.